My newly completed novel is The Fall of the Berlin Wall, about what happened to characters from my Hungry Generations fifteen years later; it's about musicians and particularly the intense, irrepressible daughter of the legendary pianist at the center of the previous novel. My 2015 novel, The Ash Tree, was published by West of West Books in conjunction with the April 24, 2015 centenary of the Armenian genocide; it's about an Armenian-American family and the sweep of their history in the twentieth century - particularly from the points of view of two women in the family. There are three other novels of mine, One is Pathological States, about a physician's family in L.A. in 1962, which is as yet unpublished. Another is Hungry Generations, about a young composer's friendship in L.A. with the family of a virtuoso pianist, published on demand by iUniverse. A Burnt Offering - a fable (a rewriting and expansion of my earlier Acts of Terror and Contrition - a nuclear fable) is my political novella about Israel and its reactions to the possibility of a war with Iran (with the fear that it will be a nuclear war). Two showings of "The Promise," dramatizing the 1915 Genocide of the Armenians in Turkey, on December 10 were sold out at the Maltz Museum of Jewish Heritage in the Cleveland area - Beachwood, Ohio. 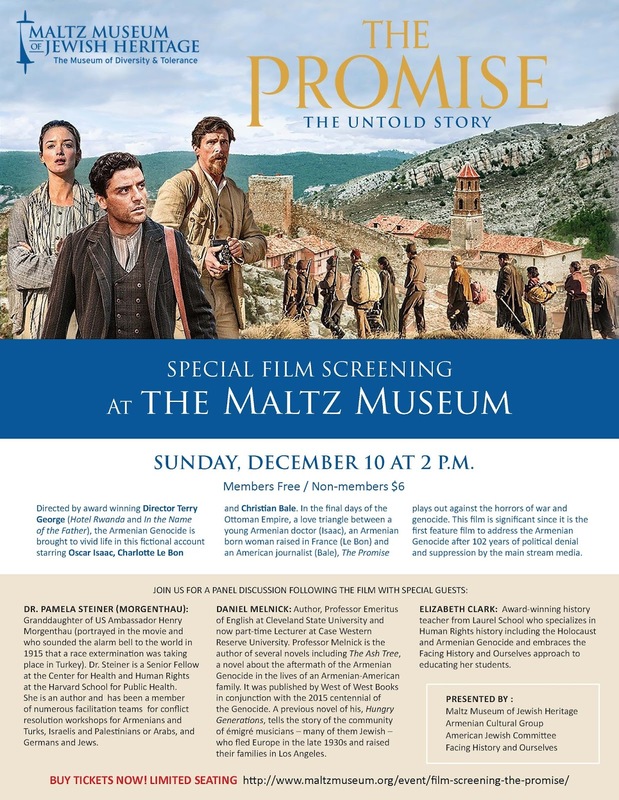 Each showing was followed by a panel discussion led by Daniel Melnick, author of "The Ash Tree," the 2015 novel about the Armenian American family of a survivor of the Armenian Genocide. 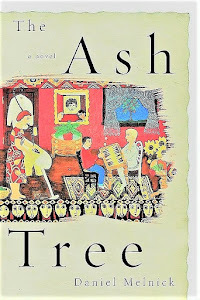 Buy "The Ash Tree" here - a novel about a California Armenian family after the Genocide. Buy "Hungry Generations" here - a novel about L.A. and European expatriates living there. Purchase "Fullness of Dissonance: Modern Fiction and the Aesthetics of Music" here. "The Ash Tree" about a family of Armenian-Americans, from 1915 to the early 1970s, is being published April 24, 2015, on the centenary of the Armenian Genocide. My 2004 novel "Hungry Generations" is about the encounter between a young composer in L.A. in the 70s and the family of a great virtuoso pianist, who knew Schoenberg and Stravinsky there in the 40s. Also, there's my critical book on modern fiction and music, "Fullness of Dissonance" (1994), as well as various stories and articles in print. My novella and story collection "Acts of Terror and Contrition" was published in 2011. Current projects: "Pathological States" (an unpublished novel), "Conrad in the Twentieth Century" and "Beethoven and modernity" (both non-fiction books). I'm married to the artist Jeanette Arax Melnick, whose paintings are on the cover of three of my books. You can contact me either by leaving a comment on a post or at danielcmelnick@gmail.com. Jeanette's Mama Metafora's Market recipes, etc. "Crazy Jane Talks to the Bishop"
"The Idea of Order at Key West"
Why hast thou forsaken them? copyright 2019 daniel c. melnick. Simple theme. Powered by Blogger.